You’ve probably seen hundreds of inspirational quotes - such as the one above from Brian Tracy - encouraging you to step out of your comfort zone, take on new risks and challenge yourself. It’s (supposedly) good for you and may even lead to something big. Change takes effort, time, and courage too. After all, the comfort zone is a space where our activities and behaviors fit a routine and pattern that minimizes stress and risk. We’re “at home”, happy and relaxed. 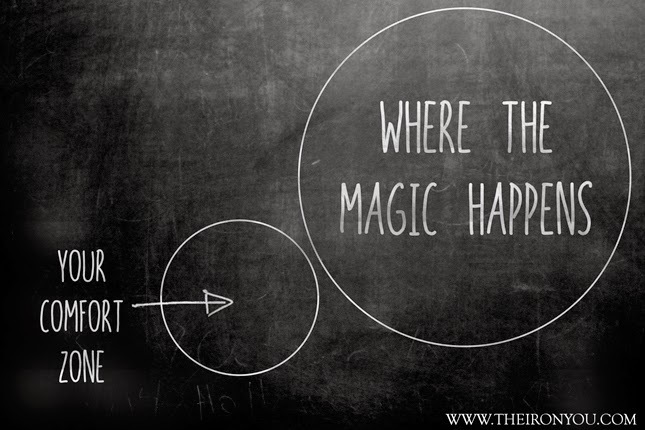 The comfort zone is neither a good or bad thing; it’s more like a safe zone that we all need. However, sometimes, it’s good to step out of it. I’m not even talking about lifetime changing experiences. I always see things like BASE jumping, moving abroad or changing career being shown as examples of getting out of your comfort zone. It doesn't have to be anywhere near that large or on that kind of scale. You can start by adding a little discomfort to your every day. Such as trying a new food, a new workout or doing some social things that you would not do normally. For instance, you can try the Paleo Whole30 eating regimen for a month, or going vegan or vegetarian for a weekend. Taking the stairs instead of the escalator/elevator or try new music every week. Small (or big) things that allow you to keep from getting stuck in the same old rut. You may even discover a ton of new exciting things and develop a better understanding of yourself. My first Bikram yoga class - which I took because I’d lost a bet to my friend Christina - was filled with insecurities (I had the typical prejudices that a guy might have: “Yoga is for women and hippies”) and fears (“I’m so un-flexible that I’m going to make a fool of myself”). It was a big step outside of my comfort zone, but I can now say that it has been almost life-changing. A friend of mine has the so-called “sushi rule”. Every time he orders sushi, he has to pick at least one one item he haven’t had before. That’s how we discovered that sea urchin sushi tastes like a million bucks. The key is to find things that you actually want to do, but know that the idea of doing them make you uncomfortable. Since for many people it can be very challenging to step outside of their comfort zone, starting small may be actually the key to succeed. If you change little habits, you learn to develop a curiosity for new and exciting things, and you’ll be able to push yourself outside of your comfort zone more often. We all feel comfortable within our little worlds, but if we don’t challenge ourselves beyond it, how do we truly know what we are capable of? Try to make a "new normal" for you, it feels good! Such an interesting read. Thanks for sharing! You are right that stepping out of your comfort zone can bring about wonderful things in your life. Getting married (at age 63) did that for me, all the travel we do has helped me grow, and then at age 67 I learned how to scramble around on big rocks at our local state park, as part of our training to become volunteer tour guides. It's amazing how something like that, for someone like me who has never been at all athletic, changes my confidence level and my outlook on life. Thank you for encouraging us in this direction. Susan, your story is really inspiring. Good for you for challenging yourself and becoming a new you! you hit the nail on the head, stepping out of the comfort zone is the best move! You should write a book about your story, it's so interesting. Now I want to know more! You are indeed right - stepping out of one's comfort zone doesn't have only involve the big choices but the small ones too - it's or this exact reason that when my daughter was 3 we started a "new fruit/veggie a week" idea - where she (and I) HAD to pick a fruit or veggie which we (mostly she) hadn't tried before and give it a go. I think that little thing when she was 3 pervaded alot of areas of her life, and she sometimes lectures me on "my comort zone" these days - a story for another time! I said it before, but I will say it again - AWESOME post! Hi Mike, so true, for myself reaching out to others after starting a blog has been a big thing for me. Baby steps I guess! Great post, something to keep thinking about. Happy Sunday! I totally agree with you Mike. Such a fun and inspirational post! Wonderful post, Mike! You're so right! I used to be really scared of swimming (oh well, not scared per se, I just dreaded it because it seemed so dull to me), until I gave it a go and now it's one of my favorite exercises ever! Loved this post! It's so easy to stay with the familiar to avoid disappointment, but then you miss out on the sushi experiences of life! Lovely post! That's how I choose to live life. Bikram yoga was also very scary for me, but today I can't live without it. I hated small spaces, sweat, the smell of sweat, crowded rooms etc. Bikram has thought me so much!